Curry leaves, known as kadi patta in Hindi, come from a tree that’s native to India. Not surprisingly they’re widely used as a flavouring in Indian cooking. They can be crisped in oil and used to garnish dishes like dhokla or added to enhance curries and dahls. The health properties of curry leaves aren’t as well promoted as those of other Indian ingredients, like turmeric, but they’re just as impressive. Curry leaves have antioxidant properties that help protect against liver damage and they can also play a role in maintaining healthy blood sugar levels. Among other more quirky benefits they’re said to both promote hair growth and act against premature graying of the hair. Fresh curry leaves are great if you can get hold of them, but for me they’re not always easily available. So when my local wholefoods store recently introduced dried curry leaves I stocked up and started experimenting. This chickpea and coconut curry is a good example of how a few dried curry leaves can take a curry to another level. I came across the recipe on the site of a fellow food blogger called Vegan Richa. She has a lovely blog full of, in her words, simple and delicious plant strong recipes that are often inspired by her Indian roots. There’s so much to love about this curry. It’s gluten free, vegan and is both quick to prepare and easy to adapt. You could use lentils or other pulses in the place of chickpeas. Or use different vegetables – peas or cubed eggplant would work well. I pretty much followed Richa’s recipe with just a few small adaptations – like starting with a ginger, garlic and onion paste for the base and throwing in a few extra curry leaves (her recipe calls for 12-14 but I used more). 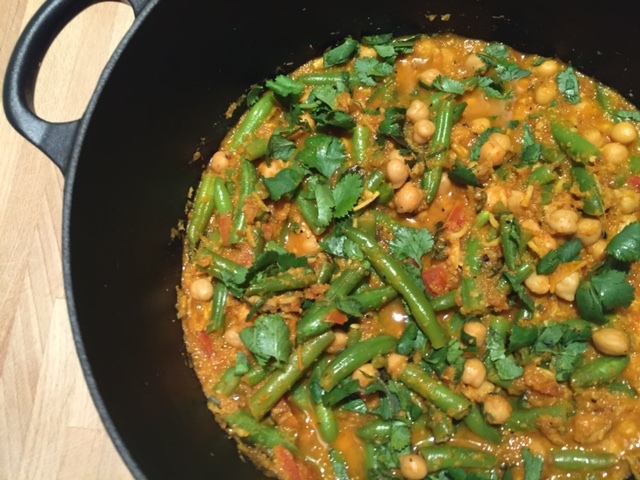 Richa calls this recipe chickpeas in coconut pepper curry leaf sauce. Go check it out and I’m sure you’ll be tempted by the other vegan delights on her site too. If you do manage to get hold of (or already have) curry leaves then you may also like my recipes for Indian pineapple pickle and dhokla with mustard seeds – both would pair well with this curry and also use a generous dose of these healthy leaves…..
For those of you coming to the end of the week – Happy Fiesta Friday. Go check out some of the lovely recipes at this week’s Fiesta Friday #136 party, hosted this week by Judi at Cooking with Aunt JuJu. And of course be sure to enjoy lots of weekend feasting……. Tags: chickpeas, coconut, curry, Indian, vegan. Bookmark the permalink. I have been reading all the goodness about curry leaves too. I try to grind mine with the ginger and garlic so we eat a lot of it. Great post. I am working on a chutney with curry leaves too. I will blog it once I am ready. Thanks for the lovely comments Judi – and lucky you being able to have fresh curry leaves to hand! Happy Fiesta Friday. There’s nothing quite like curry leaves to enhance a curry. I also happen to love the smell of it. I get mine from the Indian store and freeze it, as it isn’t readily available in a regular grocery store. Love your recipe, reading through the ingredients, it sounds quite wonderful! Thanks so much Loretta – and great tip on freezing them, I am going to try that next time! This looks great Laura! Yum!